Peel and core apples. Slice into 1/4-inch thick pieces. Toss with brown sugar and cinnamon. Transfer to a small baking dish. Bake for 30 minutes or until tender. In a large bowl, combine dry ingredients, reserving granlated sugar for later. In a large bowl or glass measuring cup, combine liquid ingredients. Separate eggs, adding the yolks to the milk mixture and the whites to a clean medium bowl. Whisk milk mixture to combine. Pour into dry mixture, whisk or stir to combine until nearly smooth. Set aside. Beat egg whites until soft peaks form. Add in granlated sugar. Continue beating until stiff peaks form. Fold egg whites into batter until no streaks remain. Add batter to coat waffle iron, cook until dark and crisp. *Do not overfill. Transfer to a wire rack to stay crisp or to an oven set at 250°F to keep warm until ready to serve. Repeat with remaining batter. 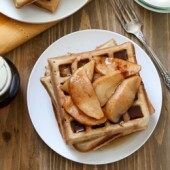 Serve waffles with cooked cinnamon apples, maple syrup and whipped cream, if desired. *Batter amount and cook time will vary per waffle iron size. Refer to your manufacturer's instructions for proper amount and time.